Out with the red shirts and in with the wet shirts. Songkran is the Thai New Year celebration that lasts from April 13-15. 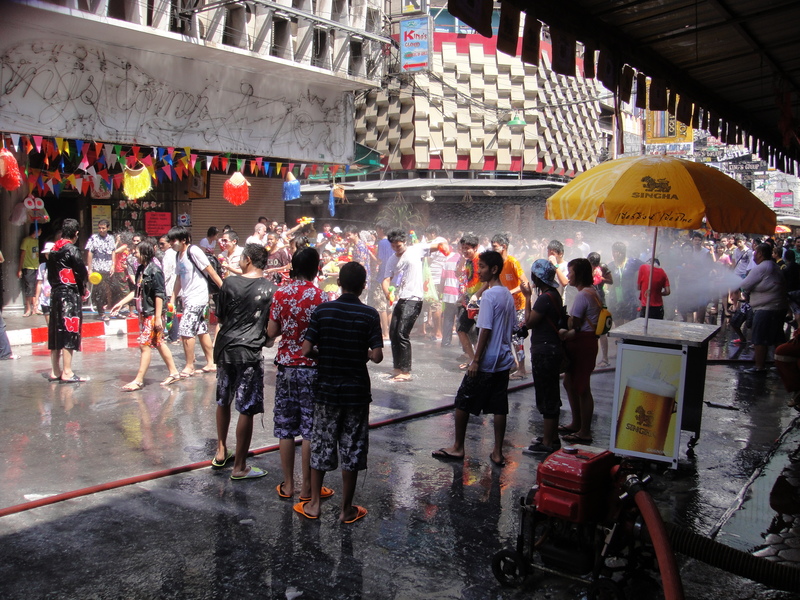 It is also know as water festival, with most Thais asking foreigners to go “play with water.” Basically everyone is throwing water on each other via buckets, hoses, squirt guns and anything else in site. The sides of roads are lined with people throwing water on cars, motorcycles, people, police and especially tuk tuks. Some of the popular tourist streets are closed to cars, they are turned into a giant water fight. The bulk of the water throwing takes place in the afternoon, during the heat of the day. Water has been part of the Songkran festival as Buddhas were cleaned or cleansed with water to start the New Year; people would capture the water used for the cleaning and pour it on others for cleansing. Songkran is also a time to visit the Wat and pay respect to the monks and say a prayer for a happy year. At some point the throwing of water just became fun. April is the hottest month of the year, a great time to spend the day throwing water on each other. I am not referencing throwing a bit of water, this is everyone on the popular streets for the festival being soaked to the point you need to ring out your clothes and your shoes have an inch of water in them. Who knew adults would still like to play with water? 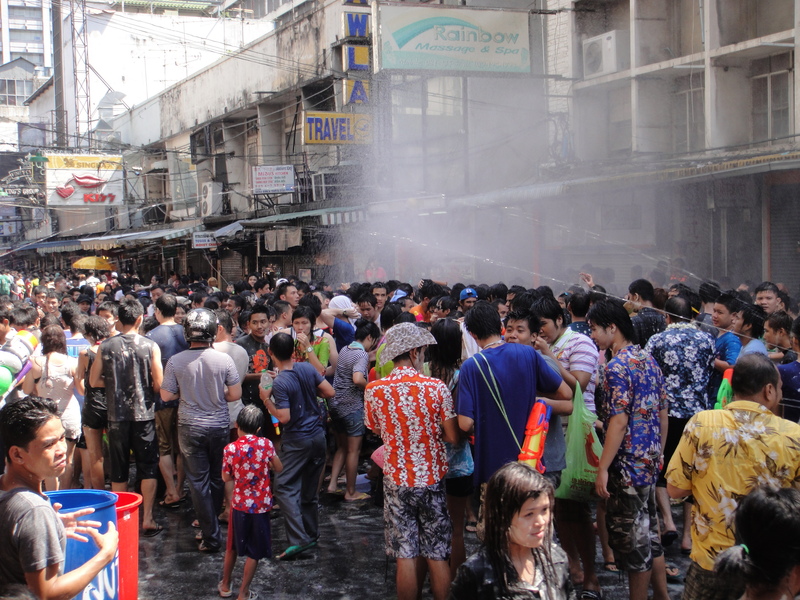 I ventured to a number of places around Bangkok, all fun, in full swing and water being thrown everywhere. The best part was driving across town in a tuk tuk with people standing on the side of the road throwing buckets of water into the tuk tuk and completely soaking us. We had large squirt guns, about 2’ in length but they were no match for the buckets of water. There are loads of tuk tuk roaring around the streets with raging water battles between the tuk tuks. It was such a fun day. Pickup trucks of Thais with giant buckets of water in the back were driving up and down streets, throwing water on everyone. The red shirts were leading the festivities, out and about in cars and trucks throwing water and having a great time. I am amazed; at no time did anyone get upset when they were doused with water. I kept waiting for one man to go up to another, douse him with water and a big shouting match would ensue. Nope. I was also surprised how the adult Thai people seemed to enjoy the holiday even more than the children. Maybe a big water fight is just what everyone needed. This entry was posted in Bangkok, Culture, Thailand, Weather and tagged songkran 2010. Bookmark the permalink.